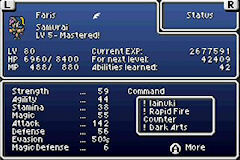 In Final Fantasy 5, characters can learn a ridiculous number of skills… and only have a use for a few of them. This is because characters are given only four battle commands, and most classes pick three of those for you. Therefore, you really can only combine two classes at a time, until you use one of the two end-game classes made available to players— the Freelancer (which gives you Fight, Item, and two chosen abilities), and the Mime (which allows the Mimic command and *three* chosen abilities). This hamstrings the possibilities that the game’s engine seems to want to give the player, and in my opinion reduces the fun that could be had. 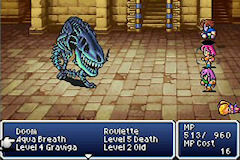 The Custom Classes mod seeks to maximize the choices available to the player within the confines of the Final Fantasy 5 4-battle-command-system. 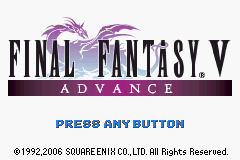 You are allowed the maximum leeway granted by the game’s engine to assign commands and abilities that you have earned as you progress through the game. More care must be taken so that you don’t employ unwinnable strategies (such as forgetting to set a “Fight” command to your characters…!) Spells and monsters have been modified slightly and hopefully are balanced with the customization options available to the player. The new version of the mod opens up the four “Advance” classes (Gladiator, Oracle, Necromancer, Cannoneer) by the time your party leaves for Galuf’s world. When a character masters a job, any passive abilities that job had become constant, no matter which job they may choose later (this used to be a feature of the Freelancer class only). It also rebalances the stats of your characters based on the Abilities that you assign. To peruse a more exhaustive changelog, go to http://jeffludwig.com/ff5a/download.php. You can also download an useful spreadsheet pertaining to the Custom Classes mod (in .xls format).